Mathi Peera Pattichathu or sardines cooked with grated coconut is a popular Kerala lunch -seafood dish with enticing flavors! 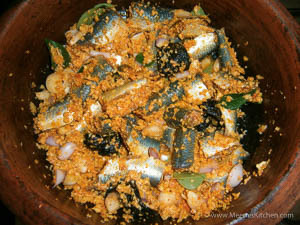 Kozhuva (Anchovies) or Mathi (Sardines) are usually used for making traditional Kerala style Meen peera. However, you can use any small fish for making Meen peera. 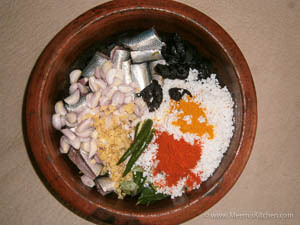 Fresh sardines with freshly grated coconut and Kudampuli (Fish Tamarind) are used for making this dish. In some places, raw mangoes are added instead of Tamarind or a mix of both to enhance the flavors. In Kerala style fish preparations, Kudampuli is a major ingredient, like Alleppey Fish Curry, Kottayam Style Fish curry, Fish Masala etc. I also love the Ayala curry with Mangoes and also the Pressure cooked sardines/ Mathi preparation made with Vinegar and tomatoes. Sambar Tamarind or Valan Puli is used in special fish curry preparation like Spicy Tangy Fish Curry, Goan style Fish Caldine etc. 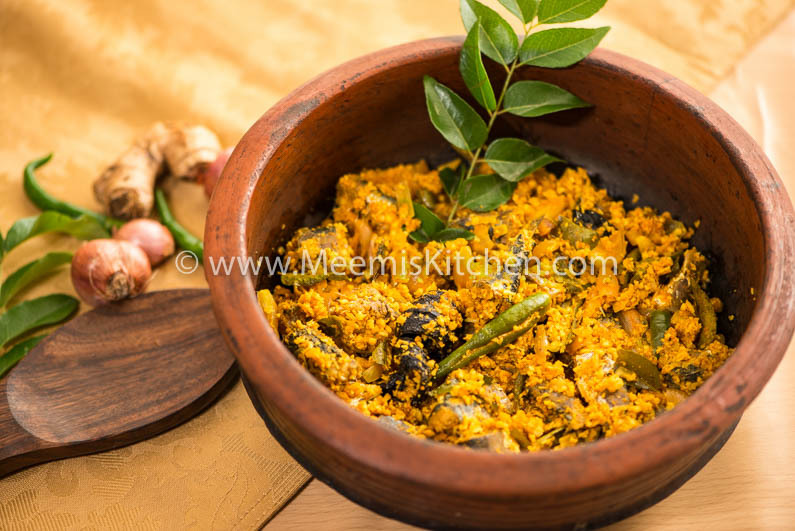 Mathi Peera Pattichathu is a very healthy dish as sardines are loaded with calcium and vitamins and is cooked for very little time, with just a drizzle of oil. Small fresh Mathi/sardines are a better choice for preparing this dish rather than the big ones. For most of the seafood lovers in Kerala, rice with Mathi Peera Pattichathu is all you need for a satiating lunch. Mathi peera tastes best when prepared well in advance; the more time you rest the fish, the more flavorsome it will become! Cooking in Earthen pots (meen chatti) enhances the authentic traditional taste of Mathi Peera and makes it more flavorful! This recipe of Mathi Peera is from my Mummy (my mother–in-law), which is a regular dish for lunch at our Champakulam home. No wonder our waistlines expand by the time we return, as we miserably fail to overcome the temptation of eating more and more rice with this delicious Mathi peera, Beef Ularthiyathu or Kakka Irachi fry. It is slightly different from the usual Meen Peera recipe, but easy to prepare and very tasty. Try this recipe for Mathi Peera and you will not be disappointed. Enjoy! Small Sardines (Mathi) : 10 – 12 nos. Green chilies : 4 nos. Clean and cut the sardines into half. Take a pan (preferably earthen pot), add fish pieces, finely scraped coconut, sliced shallots, split green chilies, chopped ginger, curry leaves, turmeric and chili powders, salt, tamarind and mix well. Add half glass water and 1 tsp coconut oil. Cook the fish covered and once it boils, cook on medium flame for 10 – 15 minutes. Stir in between. The water will slowly dry and when it is semi dry, turn off the heat. Keep it covered so the tamarind flavors are absorbed nicely. Transfer to a serving plate and enjoy with hot rice. No garlic is used in this recipe. Only small amount of coconut oil is required. However, adjust the measures as per your taste. Small sardines are used for this recipe, you may also try with anchovies/ Kozhuva. Instead of Kudampuli, you can try raw mango pieces or a mixture of both. Enjoy Mathi Peera Pattichathu with rice. If you like this recipe, do put in your comments or share with your friends using the share buttons on the side; that would encourage me to post more wonderful recipes. God Bless! !